I just typed up a fantastic 800 or so word piece talking about the genius that is Rockwell, and how reprints don't give the variety of his styles justice. I inserted jokes about how when trying to find the name of a piece I googled "Rockwell Lincoln" which lead to George Rockwell Lincoln, and avid Nazi, not at all what I was searching for. This was in my search to chase down a good version of one of the most striking paintings I've ever seen, "Linoln for the Defense." I talked about the state of illustration and because of the changing times, there will never be anyone like Rockwell again. Now there's some brilliant concept artists out there, and a smattering of brilliant fantasy, comic, ande magazine artists, but none quite achieve the technical proficiency that Rockwell got to, doing at least 1 cover a month for 70 years. Then I hit post, and lost it all due to computer error, and I really don't have it in me to write it again. 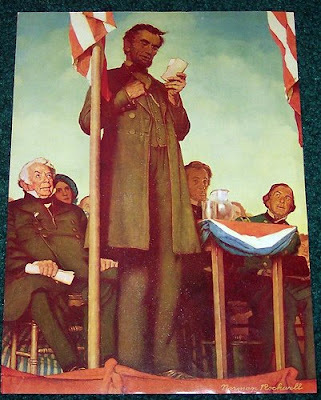 This saddens me greatly, so instead I leave you with some Lincoln pics by Rockwell. 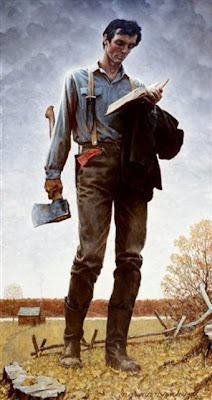 Also, if you ever get a chance to see a gallery of Rockwell's work, make sure to check it out. It will blow your mind.